Elijah McCoy’s parents—George and Emillia McCoy—were slaves in Kentucky who emancipated themselves by traveling the Underground Railroad to Canada. They settled near Colchester, Ontario and farmed 160 acres. Colchester is on the north shore of Lake Erie due east of Monroe, Michigan. Presumably, the McCoy’s entered Canada at Detroit. Elijah McCoy was born there on May 2, 1844. At an early age, he developed a strong interest in understanding how farm tools worked. Apparently, he also frequently took apart and reassembled mechanical devices. Recognizing their child’s talents, the McCoy’s saved money and eventually sent Elijah to Edinburgh, Scotland to study mechanical engineering. After Emancipation and the end of the Civil War, Elijah McCoy returned to the United States and settled in Ypsilanti. He apparently sought employment as an engineer but was not successful in obtaining such a job. He accepted employment as a fireman on the locomotives of the Michigan Central Railroad whose main line passed through Ypsilanti on its way from Detroit to Chicago. McCoy quickly realized that locomotive engineers and their firemen faced a serious challenge keeping the axles and pistons of their locomotives well lubricated. They had to stop often to manually squirt oil to axles and many moving parts. If the lubrication were used up, numerous troubles might quickly develop and lead to an accident. The need for oiling was one of several reasons why mid-Nineteenth Century steam locomotives had to stop often. To replenish the coal and water supplies were among the other reasons. To solve this problem, Elijah McCoy set up a workshop at 229 West Michigan in Ypsilanti. In 1872, he invented a device that automatically oiled the axles, gears and other moving parts of steam locomotives. This was a lubricating cup that allowed oil to flow to the moving parts at a pace a user could determine. In that year, he obtained a patent for his innovation. His patent application states that his device; “…provides a continuous flow of oil on the gears and other moving parts of a machine.” This was one of several great technological advances in this era that made railroads much more productive and orderly. All-steel cars and air brakes and effective electrical signal systems were similar developments. McCoy sold some rights to his patent to obtain capital to continue his work of developing better ways to oil machinery. He moved to Detroit, lived at 5720 Lincoln and established a firm to manufacture oiling mechanisms for a variety of industrial purposes, including rail and ship engines. In 1916, he developed devices that used graphite for lubrication of engines. In 1922, he and his wife were involved in a serious vehicle accident. Indeed, she was killed and he was seriously injured. Elijah McCoy died at age 84 in 1929. By that time, he held more than 40 patents for lubrication devices. Elijah McCoy is one of the few Michigan residents commemorated by two historical markers. 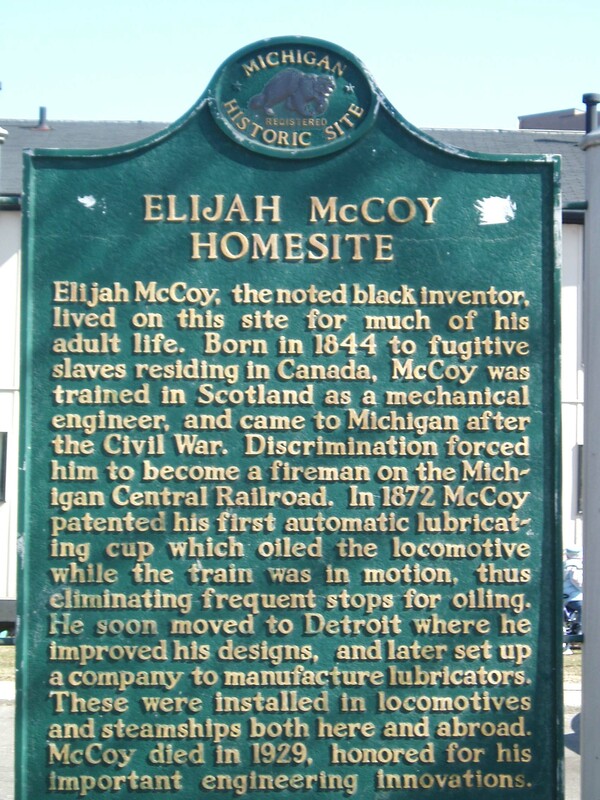 An historical marker was erected at the site of Elijah McCoy’s original workshop at 229 West Michigan in Ypsilanti. So far as I know there is no biography devoted to Elijah McCoy. The United States Patent and Trademark Office was established in 1871. Until July 13, 2012, the only office of this bureaucracy was located in or near Washington, D. C. That has changed. Acting Secretary of Commerce, Rebecca Blank, opened a branch of the Patent Office in Detroit at 300 River Place South on July 13, 2012. Senator Deborah Stabenow suggested to the Obama Administration that this office be designated the Elijah McCoy Patent Office. That suggestion was accepted. Interestingly, this new facility of the Patent Office is located less than three hundred yards from the Parke-Davis Building that is listed as a National Historic Landmark because it was the first structure built exclusively for pharmaceutical research in the United States. It is quite fitting that the first patent office away from Washington is named for a Detroit inventor. Michigan Historical Marker: Erected: December 23, 1974. This is clearly visible in front of the McCoy homes at the intersection of McCoy Drive and Lincoln.